"A reflective and engaging memoir of the only person I know who has been a lawyer, a professor of law, parliamentarian, Minister of Justice and Attorney General and a Superior Court Judge. A looking glass into the life and times of an extraordinary leader." 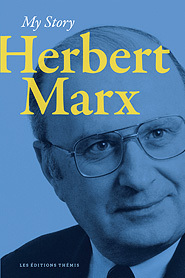 Born in Montréal, Herbert Marx received his B.A. from Concordia University, his M.A. in English Literature and a Bachelor of Law Degree from the Université de Montréal. He earned a Master's of Law Degree from Harvard University. Having placed first at the Québec Bar Exams in 1968, he received the prix du Barreau de Paris. Herbert Marx is the author and co-author of the following books: Les grands arrêts de la jurisprudence constitutionnelle au Canada (1974); Droit et pauvreté au Québec with Jean Hétu (1974); The Law and the Poor in Canada with Irwin Cotler (1977); Droit constitutionnel with François Chevrette (1982) updated by Han-Ru Zhou (2016) as well as many peer reviewed articles in law journals.